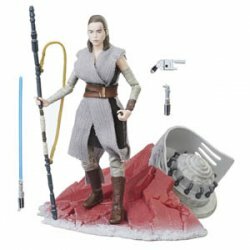 New at Toys R Us, the exclusive Star Wars: The Black Series Action Figure - Rey (Jedi Training) on Crait has been revealed! She's due in November for $34.99. The figure is a new one, more or less, with added cloth elements and a display base. Pre-ordes appear to be closed at this time.